Cotton yarn is raw white before we add the all important indigo colour dye. 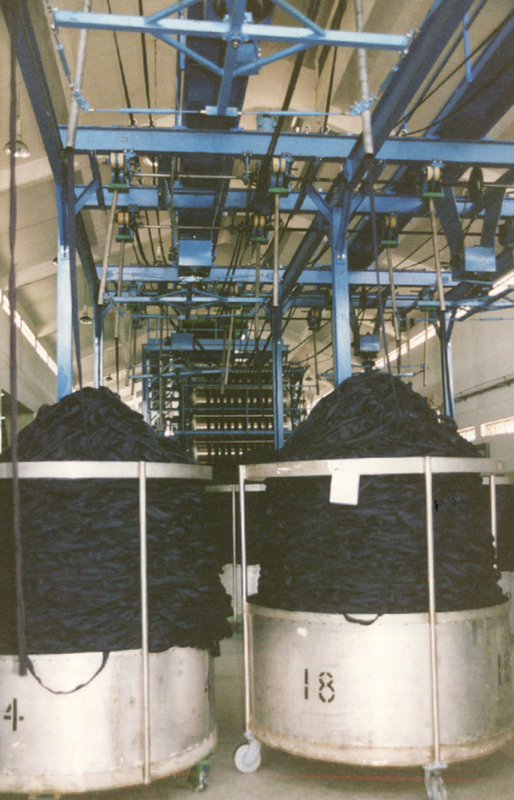 A modern rope dye range showing cotton ropes before being immersed in the indigo baths or boxes. There are traditionally a number of boxes through which the indigo can pass. Circulation pumps are used with individual boxes so that the depth and concentration of the indigo can be controlled in each box or in the number of dips. The question of numbers of dips which refers to the depth of the shade is misleading. 12 dips is regarded as being the darkest but there are not in fact 12 actual dips, the extreme depth is achieved by slowing the speed of the range to allow longer dwell time in each bath. Today the most modern dye ranges can in fact support 12 dye boxes thereby having the ability to create the most extreme depths of indigo shade. Decorated commercial yarn transportation in Pakistan. Traditional transport in Pakistan which still exists today. Mostly however such transport has been replaced by the Tuk Tuk which is a motor scooter with an integral carriage.